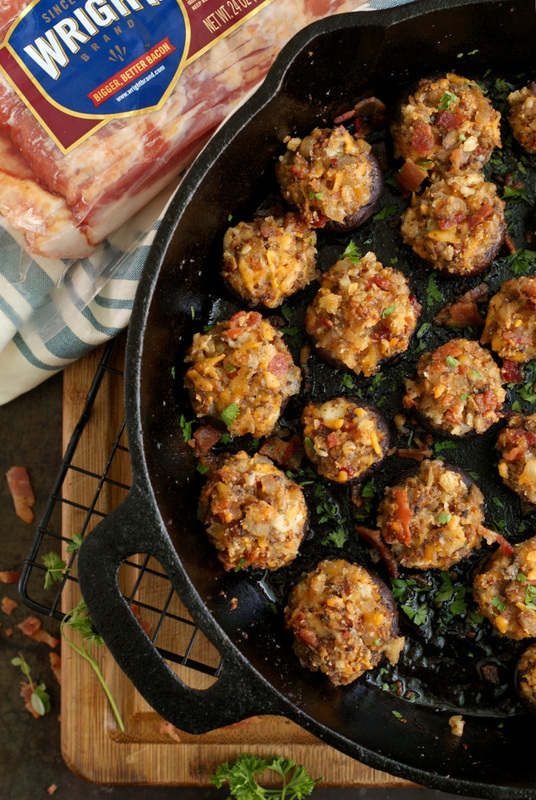 Bacon and Cheddar Stuffed Mushrooms are made by stuffing earthy cremini mushrooms with loads of thick-sliced Wright® Brand Bacon and sharp cheddar cheese, making them an irresistible appetizer for any occasion! Sometimes when I'm grocery shopping, people look at me like I have two heads. Not because I look funny or anything, that is, unless you consider yoga pants and a high bun funny looking, which you totally might. Most people are actually looking at me like I'm a lunatic while I'm browsing the aisles of my favorite Publix because it takes me so long to shop. Like, I can legit grocery shop for three hours like it's nothing. I've gotten the, "Wow, are you still here?" by employees on more than one occasion. I love to cook, and I live to eat, y'all. Cooking from scratch is a way of life in my kitchen, and because I craft my food with love I take my time reading labels, inspecting fruits and veggies, and digging through the refrigerated meat case looking for the tastiest, highest quality brands and ingredients I can find. When food is your love language, naturally, nothing less than the best will do. Seriously though, there is nothing worse than fatty, greasy bacon that shrivels up to tiny pieces when you cook it. I want my bacon thick-sliced, hand-trimmed, and naturally smoked with real wood chips. Luckily I don't have to look for long to find the perfect bacon that deserves a home in my fridge and my belly because Wright Brand Bacon has got the bacon biz on lockdown. Translation: Wright Brand Bacon is the best of the best! 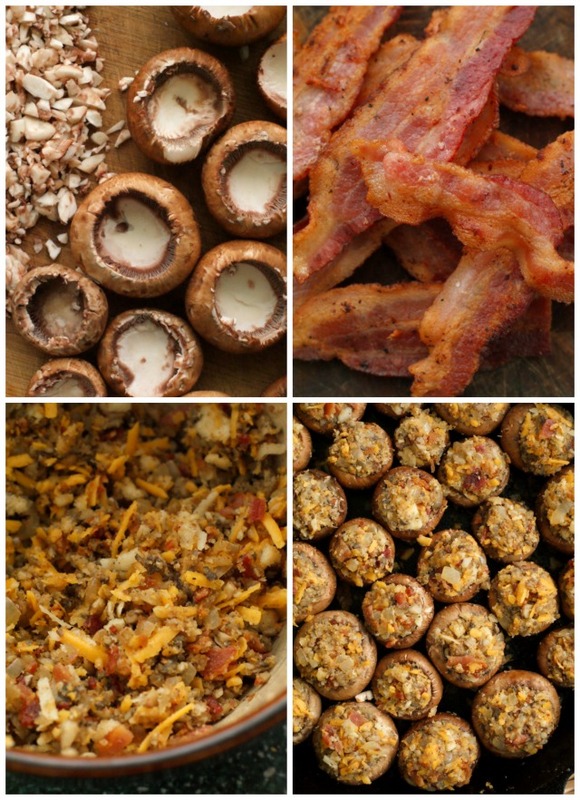 It doesn't matter if I'm frying up a pack to go with our breakfast, sliding a few pieces into a grilled cheese for lunch, or stuffing oodles of bacon crumbles into mushrooms as an appetizer for dinner. 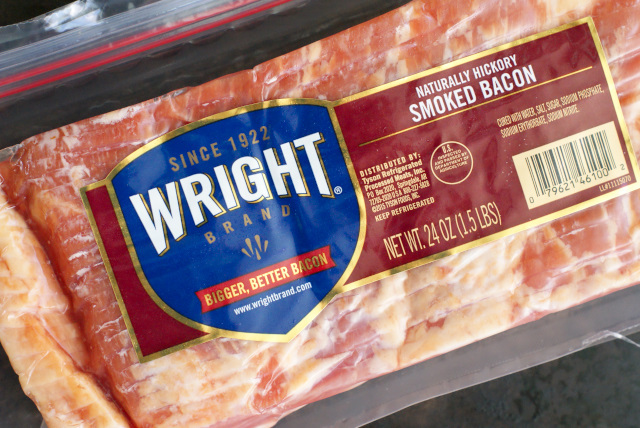 Wright Brand Bacon is where it's at. Trust me, I take bacon very, very seriously and I would not steer you wrong. I purchased my Wright Brand Bacon at my local Publix. This bacon is masterfully crafted for a richer bacon experience and comes in a variety of flavors. Flavors of bacon, you say? That's right, Wright Brand Bacon is available in Hickory Smoked, Applewood Smoked, Smoked Brown Sugar Bacon, Bourbon Barrel Smoked, and Oak Barrel Smoked. There is a variety for every recipe you can dream up. I can't wait to get my hands on a pack of the Bourbon Barrel Smoked on my next trip to Publix. How good does that sound?! For this recipe, I went with the Hickory Smoked variety, which I loved. I fried it up until it was nice and crisp then combined it with sharp cheddar cheese, onions, garlic, and some simple seasoning. 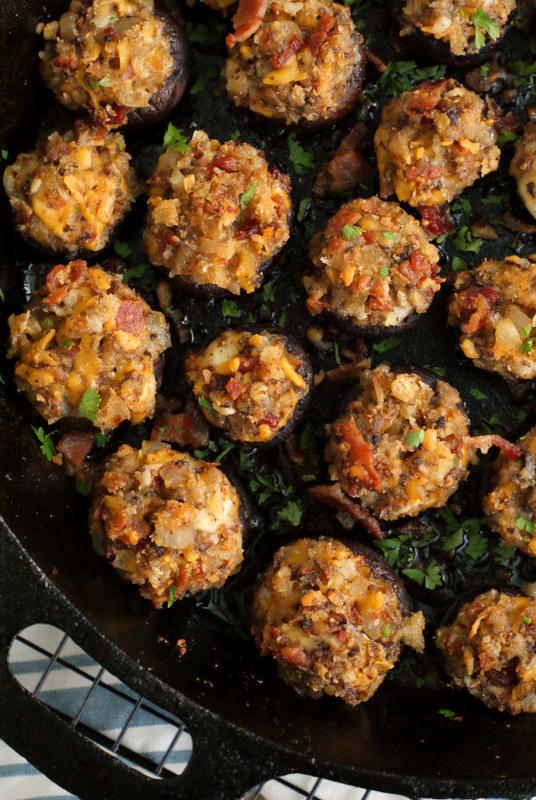 All that goodness got packed into some cremini mushrooms (also known as baby bellas), which were arranged in a nice heavy cast iron skillet, then popped into the oven until the mushrooms were tender and the filling was beautiful and golden. If these babies don't make your mouth water, well then I don't know what will. When you make something that looks this good, you've got to share, amiright? They would be absolutely perfect for game day, Thanksgiving, Christmas, your birthday, my birthday, your goldfish's birthday...you see where I'm going here. These little beauts are ideal for any occasion at all! If you haven't tried this stellar bacon yet, by all means, head to Publix and pick up a pack stat. Once your family smells that intoxicating smell wafting from your kitchen as you cook it, they'll be running to the table! And just for fun, make sure you drop by the Wright Brand Bacon voting poll to cast your vote for Bacon The Wright Way™! Which flavor will get your vote? Wash the mushrooms and cut off the hard tip end of the stem. Remove the stems leaving a cavity for the filling. Finely chop the stems and set aside. In a large cast iron skillet over medium-high heat, cook the bacon until crisp. Transfer to a paper towel-lined plate. Drain most of the bacon grease from the skillet, leaving about 1-2 tablespoons. 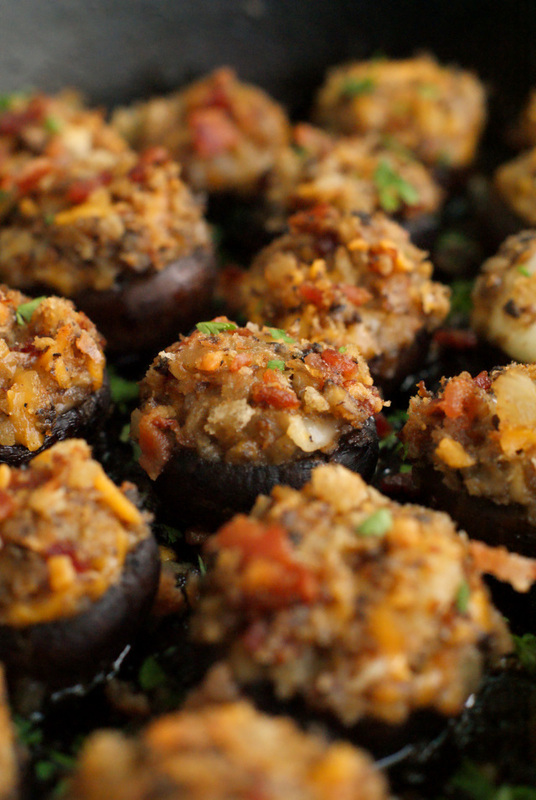 Add the chopped mushroom stems, onions, and garlic to the skillet, season with paprika, salt, and pepper, and cook in the bacon grease for 4-5 minutes, stirring often until stems and onions are softened. Transfer mixture to a large bowl and remove the skillet from the heat. Chop the bacon and add to the bowl. Add the shredded cheese and breadcrumbs to the bowl and stir to combine. 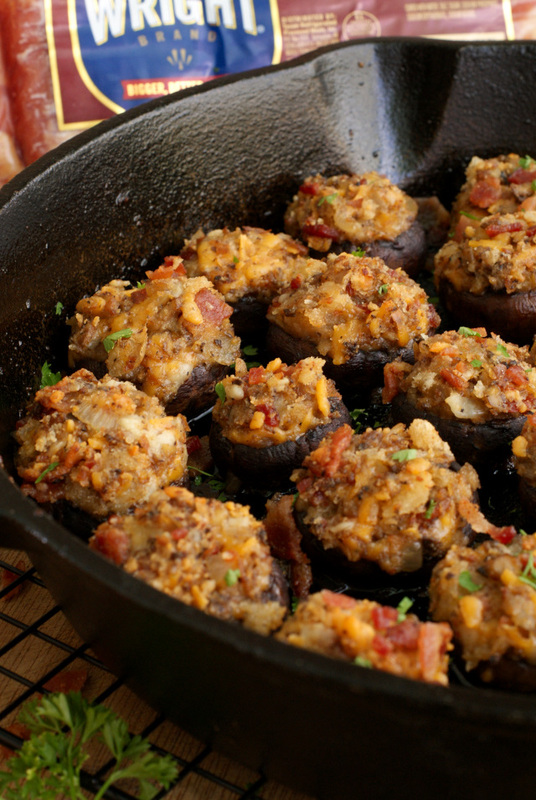 Stuff the mushroom caps with the bacon and cheese mixture and arrange in the cast iron skillet. Bake uncovered for 25 minutes. Remove from oven and top with chopped parsley, if desired. Let sit 5 minutes before serving. Using a melon baller makes quick work of removing the stems. 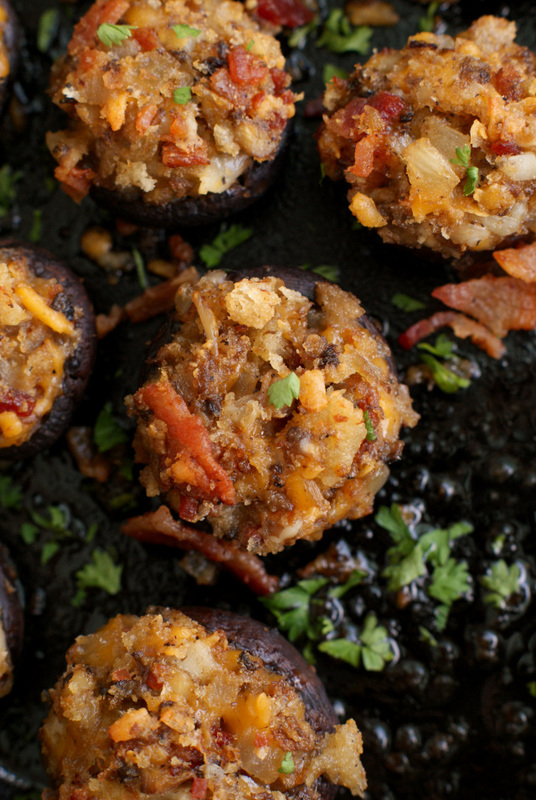 The mushrooms will shrink up when you cook them, so you can really pack the into the skillet pretty tightly! Join the conversation on social media by using the hashtag #VoteWrightBrandBacon!